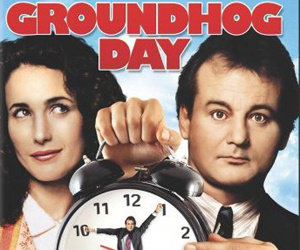 As much as I think it is a bit of a cop-out to post a link to a post I’d already written (which itself was a re-publication of a piece I’d written even longer ago), today is Groundhog’s Day and there is something about today that would seemingly make that ok. A long time ago, I wrote something about the movie Groundhog Day, by Harold Ramis and starring Bill Murray and Andie MacDowell. As a short recap, it is a movie about one day in the life of Bill Murray’s character, were he forced to repeat it infinitely. Its main premise derives from everything that could occur from a simple disturbance in how we experience time. I never turn down an opportunity to watch it. And in turn, I have never been disappointed after watching it. It is time-defyingly good. In a small digression, I’ve been doing a lot of research on watches lately. Wrist watches, specifically. For some reason, I got in my head a while back that the next thing that I wanted was a handcrafted Swiss timepiece. So in between my time spent at work, cramming for ARE exams, managing my stock portfolio (heavy on gold-short on China), wagering on professional football, and managing to be not completely asocial, I’ve been reading about works by A. Lange & Sohne, Patek Philippe, Audemars Piguet, and Rolex. It’s hard not to want to own/experience one of those things once you know about them, and the horological world is a place where the knowledge is not easily exhausted. So I’ve been looking into buying one. Not anything digital, or electric, but the kind that are called “automatic” or “mechanical.” Maybe at some point one with “complications.” Run by gears, tourbillons, gyromaxes, oyster cases, and any matter of who-ha and what-not. You know, the kind that are a bit obscenely priced, and not altogether all that practical, but contain within each of them generations of knowledge derived from experiments, engineering, and a healthy dose of artisanship and inspiration. A while ago, in another post, I wrote about how a distinguishing idea about time is the primary contribution many famous architects have made to the concept of urbanity. Embodied in each watch is an idea about time, a theory of the meaning of that idea, and a mechanical execution of that idea. They’re wonderful things, and they remind me of how personal, relative, and individual our sense of time is. It can sometimes be hard to look at work that you’ve done in the past and see how your sensibilities have changed and your interests in certain issues wax or wane. If it wasn’t for one drawing class that I took late in my college years, with a demanding and challenging professor, I would probably be a doctor today. Though I had been drawing most of my life as a hobby, the large public high school I went to in Portland, Oregon had no strong support for the arts. Art was a class that contained mostly the kids who needed easy credits to graduate (or so it seemed), and I steered clear. It wasn’t until this one drawing professor in my junior year of college challenged me in a way that I had yet to be challenged–she confronted me with tough questions, made sure that I pushed the limits of what I was capable of, and didn’t let me do the bare minimum to get by (my modus operandi up until then). No science or math teacher had done that up until then, even though my coursework throughout college was dominated by math and science (I ended up with a double major in studio art and engineering). I could mostly get by in math and science courses without having to engage anybody or anything, completing problem sets quickly and in the scheduled manner. I was mediocre, but competent, heading down the easy and obvious path towards medical school. Well, after that one drawing class, where the questions weren’t answered after 2 hours per problem set, I decided to try and apply myself as fully as I could to art. I hadn’t really been exposed to it very much in my youth, unless you count the comic books that a childhood friend and I would try to write and draw ourselves as art–certainly not the Euro-centric “fine art” that was the academic definition of the word at the East Coast college that I went to. In a way, I’m still trying to catch up on all the learning and exposure to art that other people have gotten throughout their lives. And how I got to architecture is another story. But I still think of that first drawing professor I had, and how she challenged me to use my eyes to explore and question the meaning of the world and environment we are in–to not let easy answers be a shortcut to a meaningful inquiry into what it means to be a human being in this world. To that end, I’ve finally posted some of the paintings I worked on from my first painting class my senior year of college until the day I went to graduate architecture school over on quangtruong.com. They’re divided into two different sets–”blue” and “abstract,” and it’s another story why I changed from one to the other. Again, I have to point to Lebbeus Woods blog, which is always a joy to read–an amazing ongoing document of a restless and inquisitive mind. Most recently, he posted about his relationship with the late Raimund Abraham (1933-2010). Specifically, about a trip they had made solely to debate architecture while residing at Le Corbusier’s La Tourette. Makes you want a friend like that. When I was a painting major in college, I didn’t give much attention to photography. I thought it was just, in the words of Scarlett Johannson’s character in Lost in Translation, “a phase that every girl goes through, you know, horses, taking pictures of your feet.” But as I’ve gotten older, I’ve become more and more intrigued by photography. I still have a hard time finding photographers that I like, but I find understanding and making photographs a challenging and interesting pursuit. Towards that end, I set up a little space on my other website, www.quangtruong.com, to explore some photographic ideas. Above and below are some of my first photographs. Buildings by REX/OMA. Renzo Piano. Norman Foster. I. M. Pei. Morphosis. Allied Works. All in one district; literally next door to each other and across the street from one another. Four Pritzker Prize winners’ buildings elbow to elbow. Should be great, no? Lifeless and forbidding is probably the best thing I believe you can say about any of these buildings. Though some deserve it more than others, without a doubt. I bristle at Dillon’s statement that “Architecture can only do so much.” It only feels that way because of the limited scope of consciousness displayed by buildings such as the Wyly Theatre, which seems to have no regard for anything outside of the tight shirts of its designers. Architecture can do so much more–it just isn’t on display here. From the New Yorker: “the National Endowment for the Arts’ Survey of Public Participation in the Arts, which indicates that the number of people who venture out to classical music performances in a given year has been declining for almost three decades. Further, each new generation participates less than the one that came before it. Generation X, which is now entering middle age, shows no sign of chucking its Pixies records in favor of Prokofiev.” Sadly, Architecture isn’t going to change that–certainly not in Dallas. Not because it can’t, but because it isn’t even thinking about it. Hong Kong is a small region that produces a disproportionately large share of movies. For the remaining two films of the The Future is Asian series, I’ve chosen to discuss two films by one Hong Kong director, Wong Kar-wai. This is a testament to either Wong Kar-wai’s importance and relevance as a director, or to my stubbornness and arrogance in selecting films that I believe are relevant. Wong Kar-wai is one of those consummate indie film auteurs: the kind black-skinny-pants-wearing hipster film majors love to love. Chungking Express was the first movie distributed by Quentin Tarantino’s Rolling Thunder Pictures movie company, and Wong has continued to produce highly anticipated and highly debated films—his latest, My Blueberry Nights, starring Norah Jones, Jude Law, and Rachel Weisz, made its American theatrical debut in 2007 (it received tepid reviews). However, it’s not hard to see why Chungking Express made such a splash when it was first released in the US in 1994. It’s fast, stylishly oblique, cooly violent, and full of alienated beautiful people, the kind that have occupied hipster films since Antonioni. Though infused with a distinctively Asian vibe, it nonetheless effuses a thoroughly international sensibility. Wong Kar-Wai layered and mixed the music to compete with (and at times drown out) the dialogue–this was a fairly radical idea, and his use of music throughout his later films seems to have been a result of the success of that experiment in this film. As the theme song (in this case, “California Dreaming” by the Mamas and the Papas–see the clip below) weaves in and out or abruptly starts and stops throughout the film, it sets up a rhythm that organizes the narrative structure and establishes a spatial atmosphere. But a funny thing happens when after you finish watching Chungking Express, or for that matter, other Wong Kar-Wai films: afterwards, you don’t necessarily remember the plot, or what happened, at least not in the traditional sense of who did what to whom, which then precipitated certain events, and so on and so on. In other words, you don’t exactly remember the chain of causal events that normally propel stories from beginning, middle, to end. This is not to say that Wong Kar-Wai’s films are forgettable—in fact, just the opposite. You distinctly remember the neon rush of the cosmopolitan streets of Hong Kong, the worn and tired texture of the old-city walls in that cramped, dark alley where two old friends said goodbye, the tight space of the lovers’ apartment, or the rhythm of the music that weaves its way through the images. Some images, like the food stall girl (the adorable Chinese pop-star Faye Wong) absent-mindedly bopping along to “California Dreaming” by the Mamas & the Papas (see the clip above), or the woman gently leaning her head on her lover in the back of a taxi, never leave you. Indeed, you are left with something else. We could try and call this something else visual impressions, or moods, or atmosphere, but I think it may be something which is the culmination of all of those things, yet somehow more: you are left with a sense of urbanity. Chungking Express takes its name from a bewildering, crowded mess of stores, shops, and eateries in one building in the Kowloon district of Hong Kong–it is essentially a vertical souq populated and staffed predominantly by immigrants and foreigners. To anyone who has ever been to this building/place/phenomenon, it is in and of itself an urban idea. Urbanity, as a broad concept, is inseparable from a conception of time. As our understanding and perception of time has changes, so does our understanding of cities. The most important urban theorists and architects all have differentiated themselves with a specific temporal conceptualization: from Alberti and Nolli all the way through Le Corbusier, Rossi, and Koolhaas. Wong Kar-Wai presents an essential understanding and documentation of contemporary urbanity due to his subtle, sophisticated, and irreducibly contemporary ability to play with time—most predominantly through his phrasing of visual sequences, his unique use of music, and to a lesser extent, his working method and the interconnectedness of his filmic oeuvre. Wong Kar-wai’s subject is exactly the relation between two things, time and urbanity, and in this way, proves that there are no more analogous artistic endeavors than film and architecture. Some friends of mine have been working on an indie Film Festival series; the launch party is tonight. Check it out; it’s today, Thursday, May 28, from 7-10 pm at the Sway Lounge. The website is here. For some reason, I love skeletons. So it’s nice when they move in sync with catchy British rock. Here’s my song of the moment for you, by the Friendly Fires. Maybe it has to do with movies that I watched over and over on VHS when I was growing up (below: The Karate Kid, dir. John G. Avildsen, 1984). And speaking of skeletons, coming up soon, my next posts will be a movie review of the current release, Terminator Salvation (dir. McG, 2009), and why Damian Hirst is responsible for the current economic crisis (see below, Damian Hirst, “For the Love of God,” 2007). I’ve always thought the visual presence of disobediance was an indication of a functioning, healthy city. Too much is obviously bad, but too little is also disturbing. Graffiti, and other sorts of non-violent expression, indicates a certain amount of vibrant contrarian thinking and improvised, unauthorial artistic expression. This balance between authority (planner/designer) and improvisation (participant/user) was the driving force behind some of my earliest architectural projects. I guess the best we can hope for at this point is that somebody does document what is literally being painted over as we speak.